Selection of an appropriate biogas storage tank makes a significant contribution to the efficiency and safety for each biogas project. 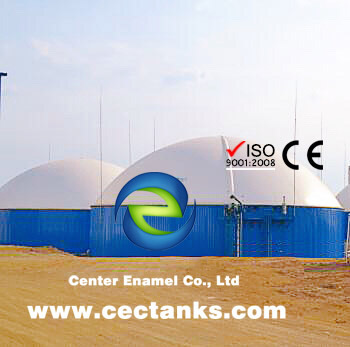 Glass-Fused-to-Steel tank with high airtightness is the best option for the biogas storage tank, which has been tested and proven over the decades. Now Glass-Fused-to-Steel tank is an integral feature in the design of any modern biogas project worldwide. Anaerobic digestion is an efficient, cost-effective way of converting biomass to energy, which also provides a sustainable solution for the disposal of animal byproducts. In biogas processing project, manure, wastewater solids, agricultural residues and food scraps are delivered to an anaerobic digester tank. The anaerobic digestion process uses microbes to break down the organic material through a fermentation process under controlled conditions, resulting in clean biogas and digested material. That digested material is then used to make fertilizer, compost, soil amendments or animal bedding. The raw biogas is further processed and water, carbon dioxide and other trace compounds are removed, and then the leaving methane and other trace gasses can be stored in the biogas storage tank. The processed biogas is then distributed and used for producing electricity, heat and fuel, or injected into natural gas pipelines. Biogas provides a clean, repeatable source for energy and fuel, while also making use of organic materials that might otherwise end up in a landfill. Glass-Fused-To-Steel Tank is made of Glass-Fused-To-Steel, special sealant, self-locking bolt, which provides the best possible combination of the strength and flexibility of steel and the inertness of glass. Glass-Fused-To-Steel also was known as glass-lined steel or Enamelled steel, is the result of coating the steel with glass infusion at high temperature (850°C). All the Glass-Fused-To-Steel are passed the 1500V holiday test before delivered to our customer, which can make sure that Glass-Fused-To-Steel is in best quality condition with high airtightness.